Thomas Kelly was an Irish immigrant who published this steamboat race scene in imitation of Currier & Ives so this image can go on one of those pages. Have not found a particular date for it yet, most likely 1860's. Can't find any mention of a steamboat named DANNA (so this could very well be a misspelling of the speedy steamer DIANA). There are three steamboats named FULTON from the mid 1800's in Way's Packet Directory. One of them may have been the boat depicted in this work of art. I bought this framed and received it last week. It needs to be removed from the frame and restored to resolve some tears and other flaws. Apparently the first editions of this work were hand colored and this has to be a later "knock off" by a publisher aiming to provide a more affordable print for the less prosperous collector. A first printing then as now would cost at least twice as much as this one did. I just received the 9.13 x 14 inch print on archival matte paper - Sure is a painting with "high definition." Attached detail from a print of the following painting. A placid stretch of the Upper Mississippi near Lake Pepin is the setting for this romantic painting of the "fashionable tour" on the Mississippi by Ferdinand Reichardt (1819-1895) a Danish-born landscape artist especially noted for his paintings of Niagara Falls. The romance of the Mississippi River captured his imagination, presumably when he traveled through Minnesota in the 1850s. In his New York City studio Reichardt painted several canvases of life along the river such as St. Anthony Falls (also painted in 1857 and in the MHS Collections) and View on the Mississippi River. Another, similar rendition of the fashionable tour, executed in 1858, is in the collections of the White House. All are probably based on sketches and material gathered from his visit to the Mississippi Valley, and all are rich in fine detail. Years ago I ordered a large print of this painting by Jay H. Matternes from National Geographic and have it framed downstairs. It's endlessly fascinating to look at and frightening to anyone contemplating swimming in the Mississippi where the water is only this clear on the upper river. Attached scan of the print to which I added National Geographic copyright. 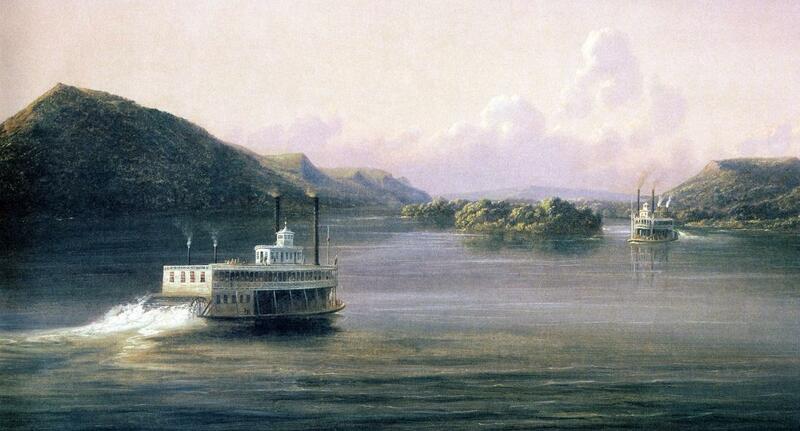 Note the distant steamboat just above the waterline in the upper right half of the painting. "Armored with hard, diamond-shaped scales, an eight-foot alligator gar glides near the surface of the Mississippi; another chases a young blue catfish. 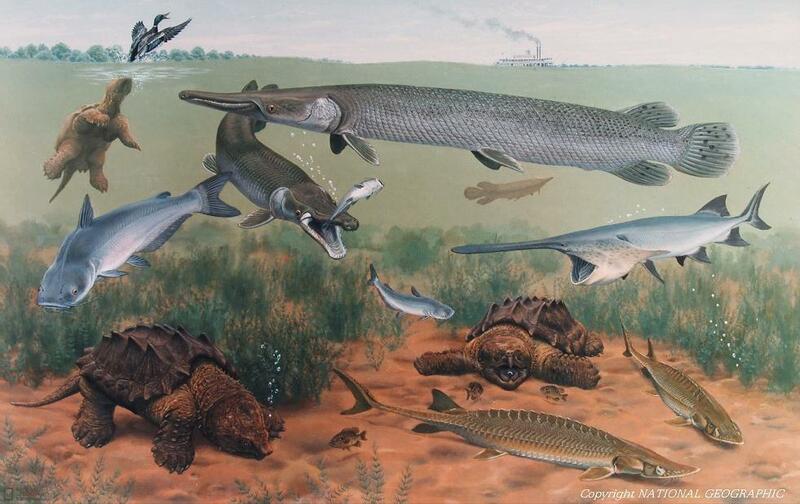 Largest fish in the river, gars sometimes grow ten feet long. Scaleless blue catfish, full size at left, may reach a hundred pounds or more. The broad, flat snout of the paddlefish possibly helps stabilize its body as it sieves with gaping jaw for crustaceans and plankton. Prowling for food, shovelnose sturgeons rake mud near the bank with sensitive fleshy barbels that help the weak-eyed fish detect snails, crawfish, and insect larvae; they vacuum the morsels through tubelike mouths. Heavily ridged shells cover alligator snapping turtles. One lures six-inch green sunfish with wormlike "bait," an extension of the tongue. Breaking the surface of the river another turtle startles a mallard into flight." 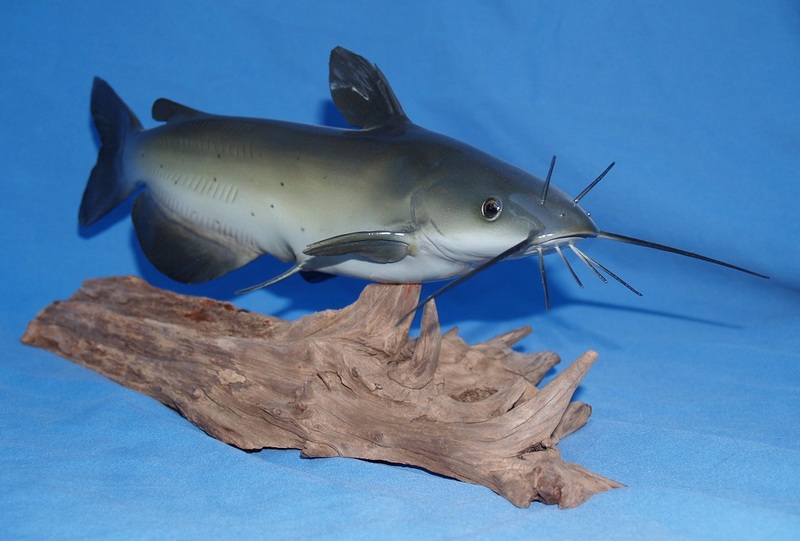 This catfish "taxidermy" is in the "replica" category with accomplished air brushed detailing. The name of the artist who accomplished this was on a special plaque that I had made that used to be in the case with the catfish but that plaque is missing, hope it turns up so I can give the creator of the work proper credit. Obtained this during the 90's in a store specializing in vintage hunting and fishing items in St. Charles, Missouri on the Missouri River. From the same dealer I also got a huge taxidermy piece of a "gar" that's in an outsized case inside a crate in the garage and hasn't been brought out to be photographed or exhibited yet. 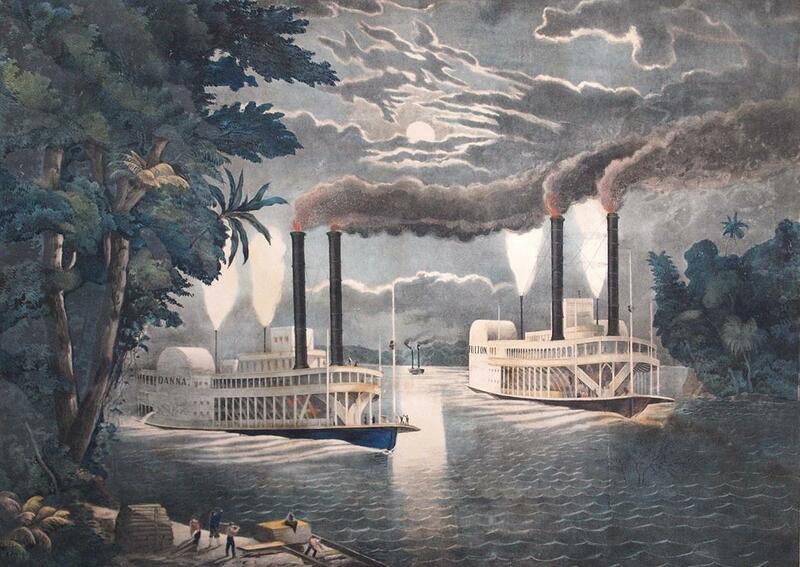 This is from a 16 X 20 print of Hippolyte Sebron's painting of steamboats on the New Orleans levee in 1853. The original huge mural-like painting is in the Dean's office at Tulane University in New Orleans. I visited there and saw it with old graduate Ray Samuel who was the biggest dealer in steamboaty stuff I ever ran across. I only bought a few things from him and had to just pine away for the rest. All his best stuff was in his own collection at his home in the Garden District. Beautiful vintage lithograph of Ralph DuPae's hometown on L.O.C. site. The NATCHEZ is not one of the five steamboats on the stamps which were: The Robt. E. Lee 1866, the Sylvan Dell 1872, the Far West 1870, the Rebecca Everingham 1880 and the Bailey Gatzert 1890. (Copies of the stamps are inset in the lower right corner of Lyall's painting). In the bottom margin is a original hand drawn remarque by Lyall of a steamboat pilot (possibly intended to represent Sam Clemens) at the pilot wheel. 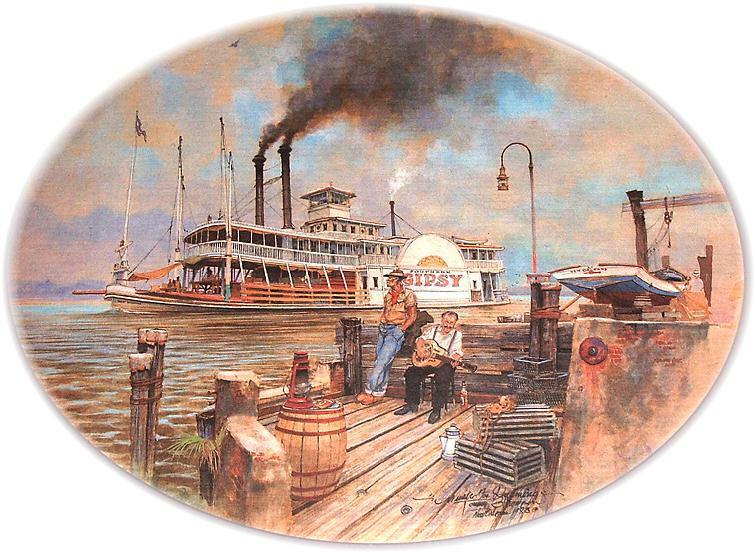 Attached a detail of a print of a painting that was apparently available on board the steamboat NATCHEZ at New Orleans but it's not currently listed online and it's not certain who the artist was. The impressionistic style of the painting is reminiscent of some of Stobart's paintings. Award-winning writer and photographer Kerri McCaffety takes on one of the greatest stories of all time, the story of the Mississippi River and the Golden Age of steamboats, the adventure and romance that inspired Mark Twain and captivated imaginations around the world. 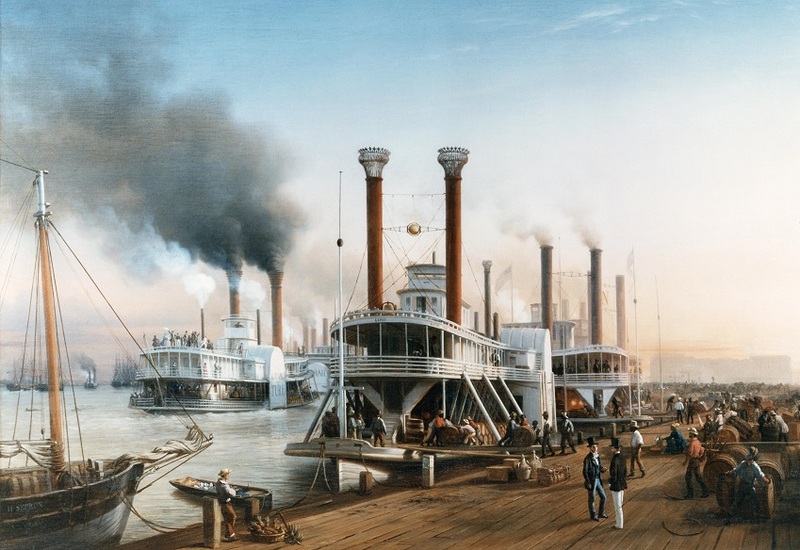 The larger history of Mississippi river transport is explored within the context of a living legacy and an elegant icon of present-day New Orleans, Steamboat NATCHEZ, the only true steam-powered boat on the Mississippi today.The first steamboat plied the waters of the Mississippi River in 1811. When the steamer, called the NEW ORLEANS, arrived in her namesake city, Captain Roosevelt invited the public to come aboard for an excursion down the river and back, a route very similar to the daily cruises the Natchez offers today. In the nineteenth century, steam power changed the world, opening up travel and trade undreamt of before. The South got rich on the exports of cotton and sugar, all carried by the big, beautiful boats. 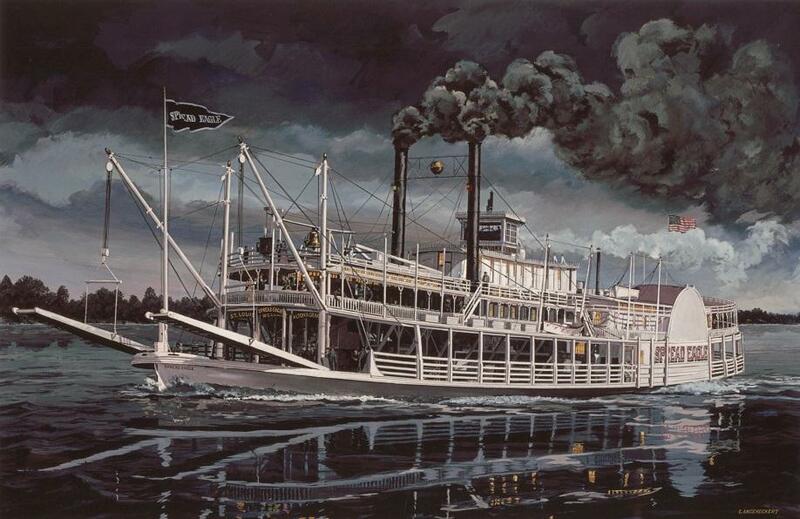 When railroads began to offer more efficient cargo transport around the turn of the twentieth century, the second golden age of the steamboat focused on luxury and entertainment. 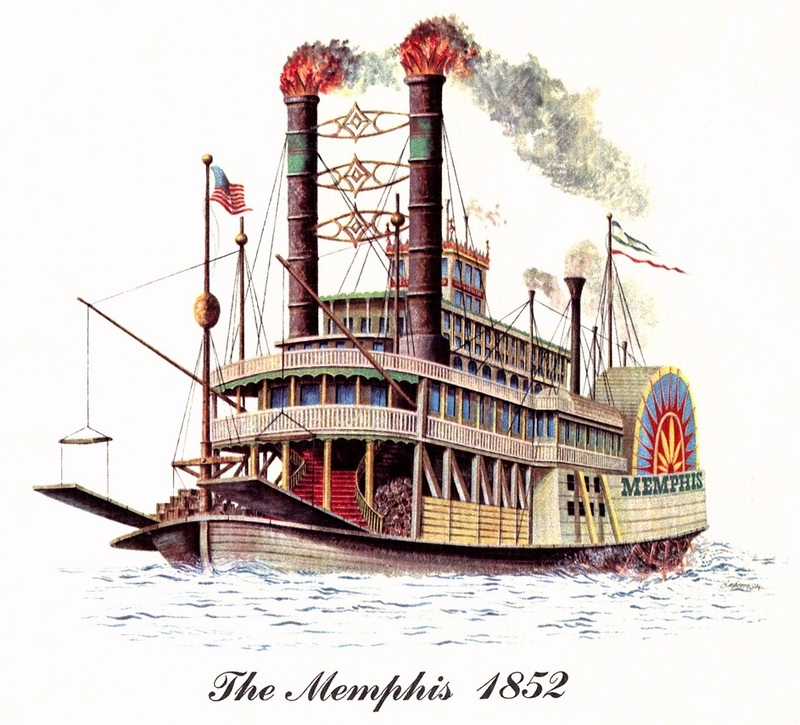 Steamboats took New Orleans jazz from Storyville to the rest of the world.The first of ten steamboats named NATCHEZ for the Mississippi port city or the Indian tribe, was a sidewheeler built in New York in 1823. 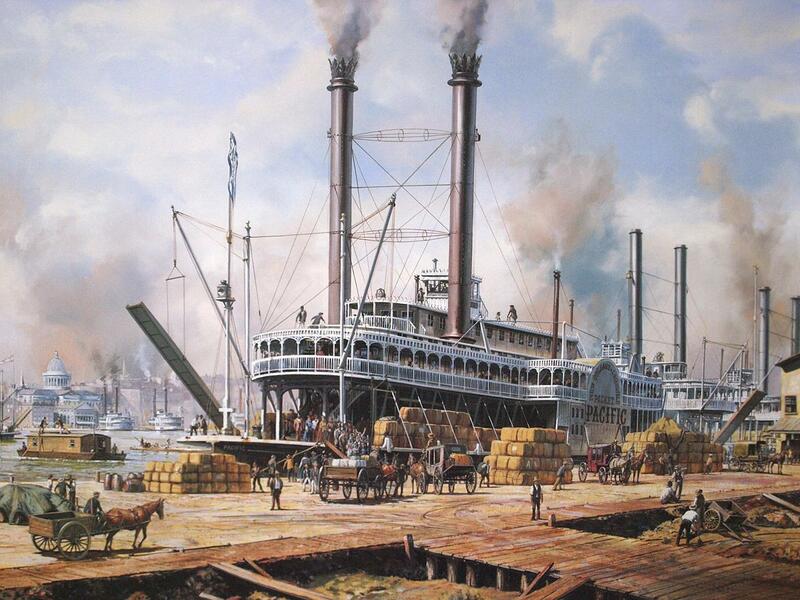 She carried passengers and cargo from New Orleans to Natchez, Mississippi. 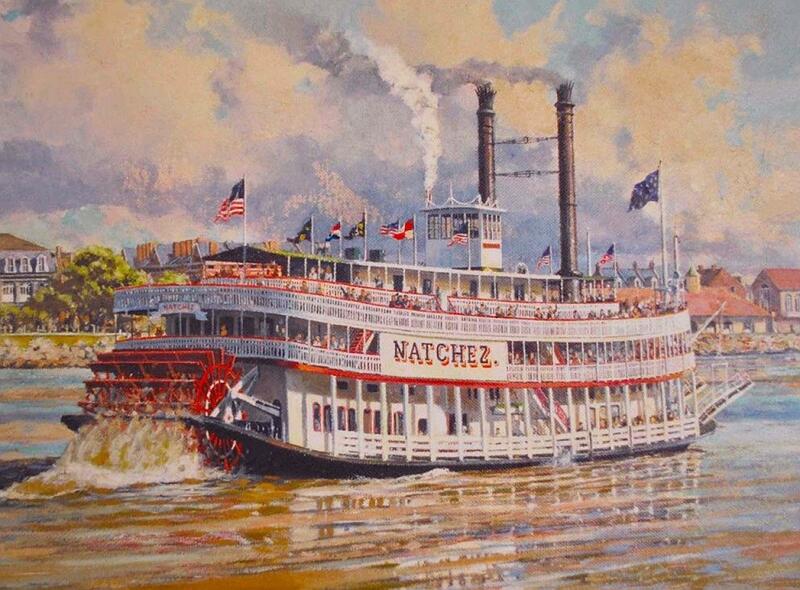 Since then, the Natchez name has meant ultimate beauty and speed on the big river. The most famous and colorful steamboat commander of the nineteenth century, Captain P. T. Leathers, built eight boats named NATCHEZ. His sixth was the racer in the epic 1870 competition with the ROB'T E. LEE. The modern day NATCHEZ, built in 1975, carries on a grand tradition. Her original master and captain for 20 years, Clarke "Doc" Hawley, is a modern-day river legend and the world authority on steamboat history. Captain Hawley collaborated on writing Steamboat Natchez, New Orleans & The History of Mississippi River Steamboats and acted as expert consultant. Detail from a print of the painting NEW ORLEANS by ROY CROSS copyrighted in the United Kingdom by Felix Rosentiel's Widow & Sons Limited 1993. The steamboat PACIFIC (1857-1860) predominates in the right two thirds of the painting. Attached my two favorites out of four Mississippi steamer paintings that artist Jerome Biederman was commissioned to paint for a mini "portfolio" of prints that was published as a promotional giveaway to customers by the Cities Service Oil Company of New York during the 1950's. The text on the front of the folder in which the prints were presented reads as follows: "ANOTHER TRIBUTE TO THE PAST from Cities Service and your neighborhood dealer." A publicity "blurb" about the Biederman's transportation themed prints for Cities Service said: "The originals were painted by one of Americas foremost transportation artists, who has vividly captured the romance of a bygone era." 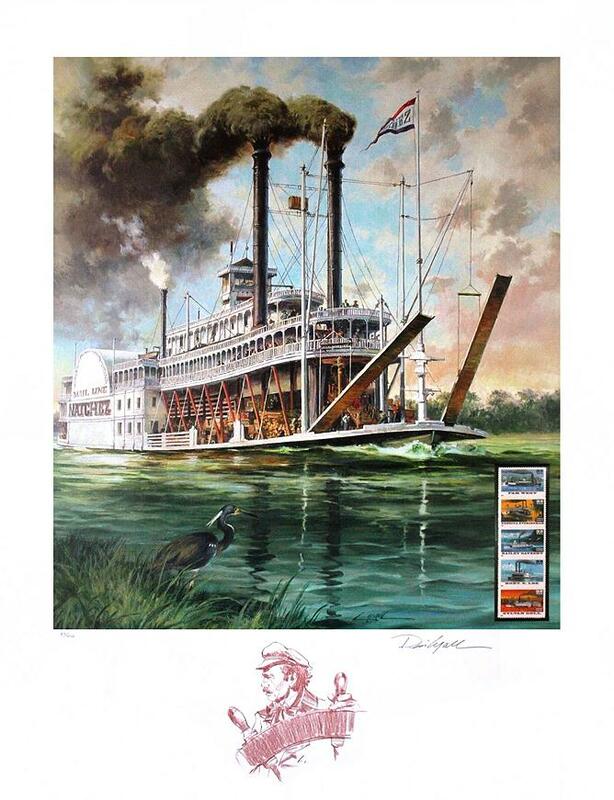 Four of the boats in the portfolio were Mississippi River steamers, others included paintings of East Coast "walking beam" style boats. The depiction of the MEMPHIS is fanciful which gives it a toy-like appearance with wild spandrels between the smokestacks; a second set of windows below the upper ones on the pilot house and "texas" cabin and curved topped on the "skylight" windows over the main cabin. The pilot house on the HUDSON was painted yellow which led me to convert that to white in Photoshop. Built at Cincinnati, Ohio in 1852. 319 Tons for the Cincinnati-Memphis trade. 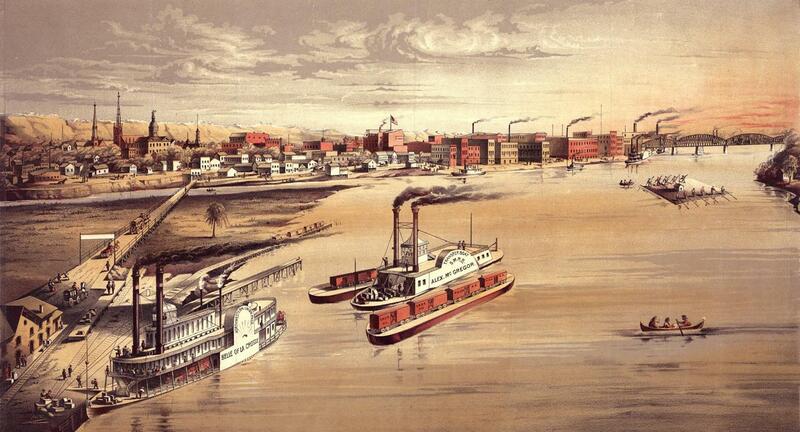 Sank below Madison, Indiana on the Ohio River on February 12, 1852 with loss of considerable cargo. Off the lists in 1860. 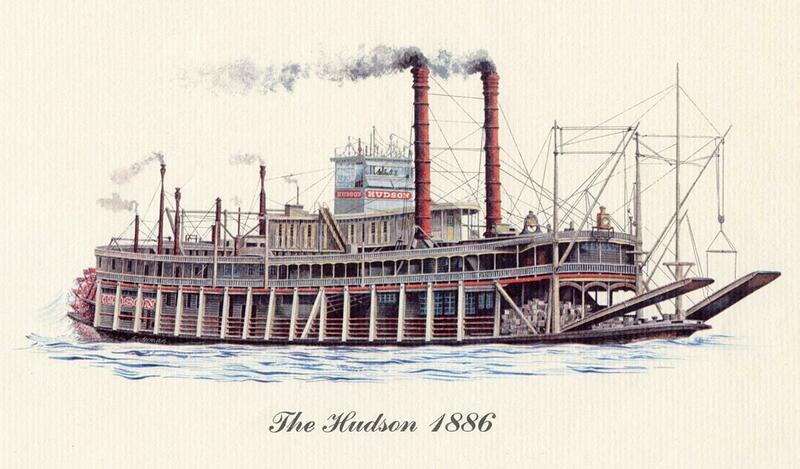 Built in 1886, hull at Freedom, Pennsylvania by James Rees & Sons; completed at Pittsburgh to run the Paducah-St. Louis trade and then the St. Louis-Grafton trade. About 1889, she ran the Pittsburgh-Cincinnati trade. Captain Ellison took stock in Pittsburgh & Cincinnati Packet Line and became the superintendent at Cincinnati. In the fall of 1898 she went to Memphis. Her last running in the Pittsburgh-Cincinnati trade was spring 1903. That summer she ran Cincinnati-Memphis and often helped out at Cincinnati taking people to Coney Island. She sank at Cincinnati at 7:30 pm on June 25, 1904, she was laid up at the time. She was raised and docked. Then at Cincinnati on February 5, 1905 at 9:00 pm she was lost in a fire.